An entity-relation diagram (ERD), also referred to as a data model, typically shows the name of each entity, its list of attributes and relationships with other entities. 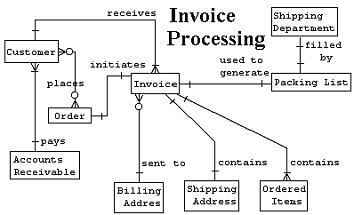 An information system can be represented as a logical or physical data model. A logical data model typically uses longer more expressive names for entities and attributes but hides other details. A physical data model can identify primary keys for each entity and foreign keys used to express referencial relationships between entities. Attribute names in the physical model are usually more concise and sometimes predetermined by the existing database schema. Data types, trigger definitions and other details can be assigned to each element of the data model. 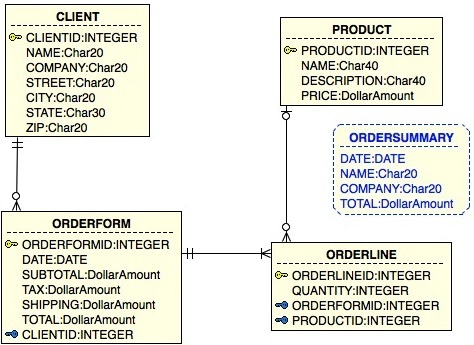 An SQL schema customized for a specific database can be generated from the data. Often the data model is later implemented by generating SQL for an RDBMS where entities become tables and attributes becomes columns. Martin's Information Engineering notation is illustrated in the ERD below.